The Do’s and Don’ts to Reignite Love in Your Relationship and Help Your Spouse Fall Back in Love with You. Warriors putting on goddess masks: A man might begin to focus on assuming more goddess tendencies. He begins to believe if he does more around the house or helps more with the kids she will fall back in love with him. Warriors, while your goddess might appreciate the help, it won’t help her feel emotionally connected in the way she needs. Goddesses stepping into warrior mode: Goddesses wanting to win their husbands back often become erratic, punishing their warriors because they are emotionally hurting and then switching to loving him to bring him back to her. This simply confuses your warrior and pushes him away even more. Telling your mate how perfect you are for each other: To win back their partners’ love one might tell the other “You know we are good together.” Of course, a person wanting out of a relationship won’t agree with this and ends up resisting or running the the other direction. Pushing your proclamation of love: “You know I love you!” Is another statement that often backfires. A spouse who feels numb or has disengaged from the relationship may not agree; may not feel that the proclamation of love is real, or true; or in in a place feeling that their love is irrelevant because it was not reciprocated earlier. Pushing your story: A person who believes they are ready to leave a relationship is likely to create a story that doesn’t reflect the other’s version of reality. When the committed mate pushes against this with their own contradicting story this puts both on opposite sides of the battle. To reignite love both partners must get on the same side. 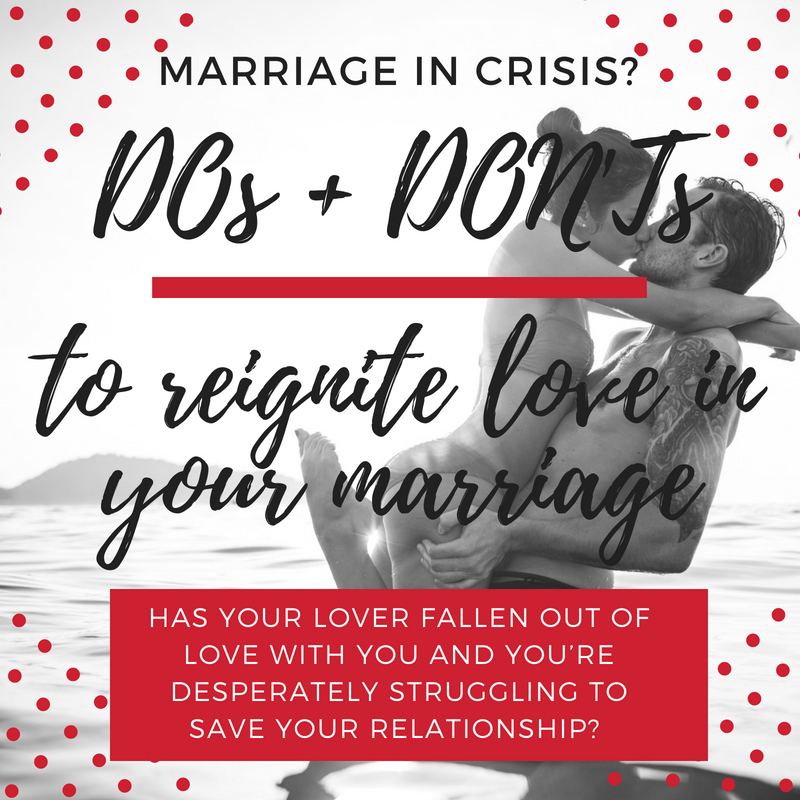 With all of these “NOT to do’s” the challenge surfaces as one spouse tries desperately to pull the other back into a relationship before they are emotionally ready. When this happens the one pulling gets discouraged and the one getting pulled only retreats further away emotionally. Step into your partner’s shoes and respect their feelings: If you want to help your lover back into your relationship, understanding the pattern of thinking that enabled he or she to move emotionally out of the relationship is critical. This requires you to resist using your logic to process your lover’s words and actions. You must step into their shoes and work to deeply understand the world from your partner’s perspective – they need you to connect with certain feelings and really see them, before they will feel safe enough to reconnect. Help your partner feel they way they NEED to feel: This is the only real way they will reconnect with you and step back into the relationship. This means that the spouse wanting to bring their partner back into the relationship understands their partners’ patterns of thinking and from the other’s perspective why love dwindled. This is crucial as the pattern that lead one to lose love is still alive within them. Interrupt your partner’s pattern of loveless thoughts: By interrupting your spouse’s pattern of thought you can impact the way they feel. Often this interruption holds the power to bring the loveless spouse a new perspective of hope. Take responsibility for the power of your own thoughts: Many couples develop thinking patterns that allow only one outcome for them. This of course is not true and only limits one’s options. In relationship terms, when one spouse see their relationship as doomed or loveless, this translates into making the thought of staying in the relationship impossible. The key is to interrupt this pattern of negativity and begin to look at things from other angles and to seek new ways to see the situation to connect with happier feelings. No matter where you are in your marriage journey, you can learn how breakthrough the shadow of feeling numb, emotionless, distrusting or desperately struggling to pull your partner back into love with you. In less than 12 weeks our clients have moved from struggle into epic happiness in their marriages and have a support structure helping them to sustain this happiness for years. 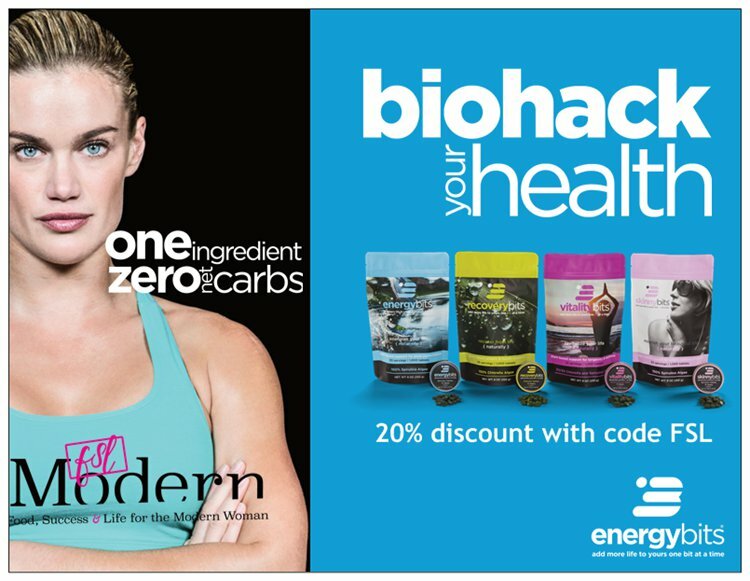 CLICK HERE to Book your FREE Breakthrough Session! Help! 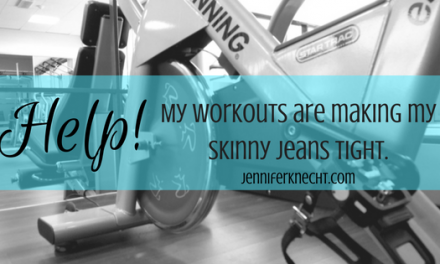 My workouts are making my skinny jeans tight! Cut the shenanigans! How does your marriage stack up?